In my last post I gave an overview of my DemoFest course, Intro to Office 2010. I would like to delve into the analysis and design of the course. When this project was brought to me it involved training for both a Windows 7 and Office 2010 upgrade, which is why some of the documents included here references Windows 7 in addition to the Office upgrade. My first step for any training project is the needs analysis, albeit it is often very informal when on short time-lines like this project. Because I had been teaching a face-to-face computer basics class, including some Office training, I had already a big jump on both knowing the audience and how they use the systems that were being upgraded. I also was provided a second work PC with Windows 7 and Office 2010 loaded on it. This allowed me to use and learn the Windows 7 operating system and Office 2010 applications while simultaneously identifying the changes staff will encounter. Keep in mind, I still had my current PC so I had the luxury of being able to make comparisons of the old and new. Once I identified the learning needs, which by the way were more numerous in Outlook due to bigger changes to Outlook from 2007 to 2010 than in the other Office apps, I was ready to draft a course design plan. The course design plan is crucial in creating an effective course and includes everything from the rationale for the course to its evaluation plan. I am providing a link so you may see a copy of the course design plan (CDP). I always circle back to my stakeholders and share the CDP with them. It shows the approach I am taking and exactly what will be taught. Keep in mind it did not reference much regarding social media. It focused mostly on the asynchronous online course itself. The social media and Intranet page were components that evolved during the development stage. FYI: If you would like to know more about my approach to writing course design plans, please visit my post on CDPs. Once the CDP was completed and reviewed by my stakeholders and subject matter experts, I like them to sign off on it, I began storyboarding the course. It is important to note, I am a "one person e-learning shop," so when I storyboard they are not handed off to developers or anyone else. These are tools for my own design and development process. So, as you can see in the examples below, they include enough detail for my own review and get quite messy. If I worked with others I would create much cleaner versions. Either way, below are several examples that show a bit of the process. Once storyboards were developed, and rewritten a few times, I then had the content, navigation, development tools needed, etc. I am was now ready move on to developing the course. Regarding the Windows 7 content that was scrapped just prior to implementation, because the course was non-linear, but had a separate section for Windows 7 sims, it was easy to isolate that section of the course and remove it. Actually, because the interface was built in Flash all I had to do was remove the button to the section and introductory reference to it. I will speak more to that in the next post in which I address course development. 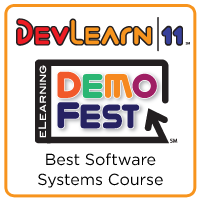 During this year's DevLearn 2011 conference I won the DemoFest award for the Software Systems Training category. Being selected for this award really put me on Cloud 9. It is so flattering to have my course selected by the DevLearn attendees. Thank you everyone who attended DemoFest. And a big congratulations to all the other winners of this year's DemoFest. It is a true honor to be in their company. Over the coming weeks I am going to blog about the processes of designing, developing and implementing my DemoFest course. My intention is to share how I go about putting a course together and to provide the support materials used to design the course. For example, the course design plan, storyboards, communication plans, etc. A good place start is to first provide an overview of the course and lessons learned as described in my DemoFest submission below. Why was this project needed? Describe why you built it. Johns Hopkins HealthCare began transitioning staff to Microsoft Office 2010 applications in February 2010. Staff required training on using the new application interfaces and learning how to complete Office tasks that have changed in the new and updated Office software. What authoring tools, systems, or technologies did you use to create this project? Adobe Flash, Adobe Captivate, Articulate Presenter, Articulate Quizmaker, Microsoft Office 2010. Social Media included Twitter, Screenr videos, and Diigo social bookmarks. How many "learners" will benefit from this program or project? 760 Johns Hopkins HealthCare staff, but the course is being extended out to additional entities within the Johns Hopkins Health System. How long did it take you to complete this project? Approximately 120 hours during a two month period. This time does not include ongoing learner support using social media and Intranet pages. What problems or challenges did you have to overcome while creating this project? Time constraints, which resulted in not including audio in the course. Limited staff participation in the social media elements, specifically Twitter. The need to use multiple development tools in order to accomplish the project’s design. What valuable insights, lessons learned, or results did you discover when working with these challenges? Due to the less-than-expected use of Twitter among staff, there was less participation in the social media elements. In the future, I would put more effort in marketing the benefits and use of Twitter among staff. Also, I would find a way to incentivize its adoption by staff. I learned that the ongoing support implemented on our Intranet pages, Screenr videos, Diigo social bookmarks, and job aids were highly valued by staff and seen as very practical and accessible resources that are continually being used. Also, the non-linear design and easy to navigate course encourages it to be also used as a refresher course. One of my most valuable insights was that the use of whimsical characters was an effective way to market the course, and increased recognition and participation in the project. Using the characters to market the course included placing full-size cut-outs of the course's main character, Captain Upgrade, throughout our buildings, and appearing on LCD screen advertisements, flyers, and on our Intranet. Below is the link to the Office 2010 course. I have also provided direct links to the learning program's social learning elements. In the next post I will describe the design process and share a copy of the course design plan and example storyboards. Thank you again to all who attended DemoFest and a really big thank you to the eLearningGuild for holding an incredible DevLearn conference.